So he said he never wants to get married … ouch! Now what? I recently wrote an article on the signs a man is never going to marry you. And they are all true. But you don’t need a list of signs if a man flat out tells you he never wants to get married (the same applies if he says he doesn’t want to be in a relationship), you need to just believe him and take it at face value. So why is it so confusing then? 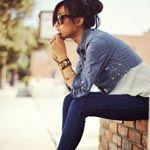 Why do women stay in these dead-end relationships? The reasons vary. Maybe she doesn’t want to end this relationship and start all over with someone new because that’s just exhausting. Maybe she thinks there’s a chance she can change his mind … that if she sticks it out a little longer he’ll realize he absolutely can’t live without her (hate to break it to you, but that only happens in the movies). She thinks maybe he’s just saying he doesn’t believe in marriage, but he doesn’t really mean it. She thinks maybe his ex really did a number on him and now he’s all messed up and he needs her love in order to heal, and then he’ll give her the commitment she wants. The fact is, the human mind is a master at coming up with rationalizations when presented with a reality we don’t quite want to accept. It can convince you of anything. And so you stay. Maybe part of you knows this is the wrong call. And maybe that’s how you landed on this article. So let’s dive in a little deeper and talk about exactly what to do when he says he never wants to get married. What Should You Do If He Says He Never Wants to Get Married? You should believe him and take this at face value. This is actually the least confusing thing a man can do, even though it feels like the most confusing to many women. When a guy says he doesn’t want to get married, he means it literally. This is not a case of him being confusing or misleading. There is no confusion whatsoever. And fine, maybe he’s not being totally honest. Maybe the truth is he just doesn’t want to marry you, but does it really make any difference? Yeah, we get it. But really, it’s all code for he just doesn’t want to be with you. That doesn’t mean he doesn’t like you or isn’t attracted to you or doesn’t enjoy spending time with you. If he tells you he doesn’t want to get married, you must believe him. Don’t delude yourself into thinking you can convince him otherwise. You can’t. You’ll just waste time and energy trying, and you’ll throw your sense of self-esteem to the wind in the process. Now it gets murky because it’s not always cut and dry … he may have some valid reasons as to why he never wants to get married. Let’s take a look at them. He may genuinely think marriage is a terrible idea. He may legitimately feel sorry for his friends when they get married. Maybe he thinks it’s unrealistic to be monogamous with one person for his entire life. Maybe he thinks the institution of marriage is archaic and unrealistic. Maybe he thinks it’s not worth it to risk half his income on something that is a losing bet, I mean we’ve all heard how most marriages end in divorce. 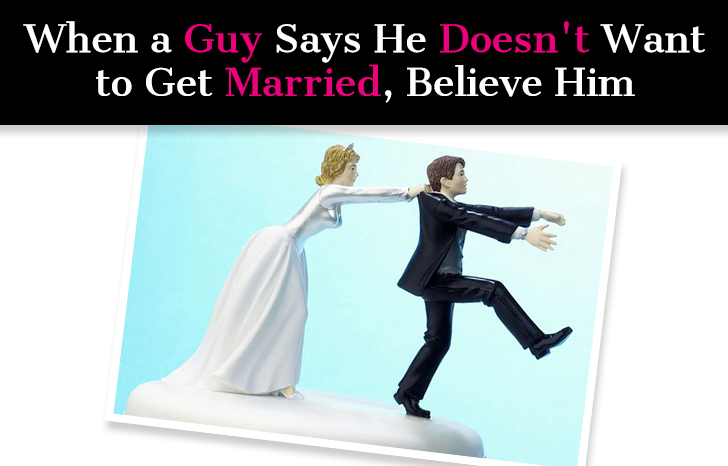 If he genuinely does not believe in marriage, nothing you say or do will convince him otherwise. Can he change his mind? Sure, people change their minds all the time. But that’s a decision he needs to come to on his own, it won’t come about through you pressuring him and listing all benefits of getting married. Now what happens with a guy who swears up and down he doesn’t believe in marriage… and then marries the next girl he’s in a relationship with? In that case, he probably just didn’t want to marry you, and him saying he doesn’t believe in marriage in general was just a way to soften the blow. Either way, there’s nothing you can do about it. You just need to take the facts as they are presented to you. If you want a casual romance, then sure, stick it out, just don’t have high expectations. Maybe he says he needs more time, or this isn’t the right time. Excuses are just his way of buying time. He doesn’t want to lose you, but can’t give you the commitment you want. Now I’m not saying there isn’t any validity here. Sometimes, a man does need to be more settled before he can get married. But if one excuse turns into another… if the day comes where he has bought a house, where he has built a solid nest egg, when he is happy with his career, and then he pulls out another timing excuse, then something is up and he probably just doesn’t want to marry you. It’s up to you if you want to continue the relationship, but if marriage is important to you and is something that you want, then your best bet is to find a guy who also wants that. The problem is that so many women get caught in a trap of trying to figure out why. They can’t understand how he can say so many sweet things, how he can be so open and present when he’s with her, how everything can feel so right when they’re together … yet he can’t give her the commitment she really wants. Maybe he has valid reasons. 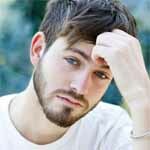 Maybe he is under a lot of pressure at work, maybe his parents’ divorce when he was a kid really did make him stop believing in monogamy, maybe the ex-girlfriend who cheated on him really did destroy his ability to trust, maybe he is terrified of commitment … the reasons don’t matter, the facts do. And if a guy says he doesn’t want to get married, you should believe him. Maybe it’s because he’s incapable of liking someone past a certain point (a point that would lead to a commitment), or maybe he just doesn’t see himself with someone like you for reasons beyond your control. It doesn’t matter. Sadly, most women believe a man not wanting to marry them is a reflection of them, and they make it their problem. They think if only they did more for him, if only they were prettier, if only they could help him learn to trust again, if only they hadn’t said this and instead had said that … everything would be different. It wouldn’t. If this is how he feels, nothing you say or do will change that. His issues are his issues. You pave the way for a lot of unnecessary hurt when you make them yours. Men are pretty literal creatures. I honestly think that it’s us women who make them out to be so complicated. When he says he doesn’t want to get married, believe him. When he says he doesn’t want to be in a relationship, believe him. But don’t take it personally. It’s not personal. Everyone has their own wants and their own preferences. Just because you aren’t what someone wants or needs doesn’t mean you’re defective, it just means you aren’t the right person for them and it isn’t a match. The same qualities that make you not a match for one man might make you the perfect match for another. So don’t get jaded because this won’t do you any favors. A man don’t want to get married for many reasons. I will NEVER get married. I still want a girl to love and commit to, and eventually have children with her; i just never want to marry: PERIOD. 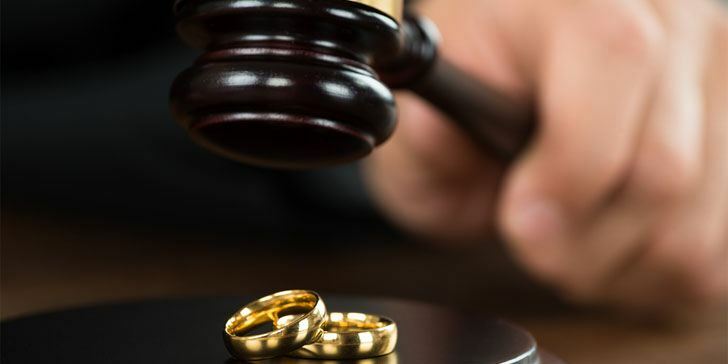 “He has seen a multitude of male friends and family members being Divorced Raped….He has seen how hostile to MEN Family Courts are….He has seen the Suicide rates for Divorced men is DOUBLE of what it is for single men…. Why on earth would any sane and rational men bring a hostile Government and Family courts into his life? My boyfriend never wants to get married. However, he will live with me, own property together, be 100% committed, and share a life with me. He just does not believe in the institution of marriage. And, frankly, if I have all the other things…I don’t really care about it either.